Build your very own Adventure Bay rescue with the PAW Patrol Launch n’ Roll Lookout Tower Track Set. Experience the fun of a true PAW Patrol rescue mission with the launching Lookout Tower that features Rubble dump truck and Ryder Racers along with Chase and Zuma Mini Figures. Tower features 6 parking spaces for PAW Racers. Just rotate and press the periscope to launch your Racer into action! Oh no – there’s trouble at Adventure Bay Bridge! Launch the Rubble Racer to save the day and repair the bridge! Build the Launch ‘n' Roll Lookout Tower Track Set with 9 track pieces, 1 launching Tower, 1 stop light and a collapsing bridge. Press the button on the side of the bridge to collapse the bridge, and then press the lever to fix it! For ages 3 years and over. Paw Patrol is featured heavily in Rocky's Christmas list this year, last year it was Ninja Turtles. Paw Patrol is a cartoon on Nick Jr, for all those reading this that don't know. A group of puppies with different jobs, saving people from different disasters or emergencies in each episode, having adventures and fun along the way. It's one of the ones I can tolerate being on my screen which in itself is a big thumbs up. If you step foot in any of the toy shops you will be confronted with a vast array of Paw Patrol toys, but which one to buy? Well, this one... as this one will make you the favourite on the day within seconds of opening, with both the child and the parent (if you aren't the parent). This brightly coloured box of joy has hours of low noise level imagination play inside for any fan aged 3+. Setting up is easy for small fingers and is pretty sturdy plastic, but please remember that they should be supervised at all times with this toy due to small parts. Their favourite characters from the show can launch themselves from the launchpad and into action, just like they do on the TV. Just turn the launcher until the pup who is right for the job is in line with the exit and press to release them onto the track. It comes with 4 of the characters (Ryder, Rubble, Chase & Zuma) but only 2 of their vehicles (Ryder & Rubble), however you can buy the others separately if you wish (could be used as pocket money earning enticement). You can also buy other Paw Patrol "Roll Patrol" sets which can interact with this one, meaning the fun is never ending. 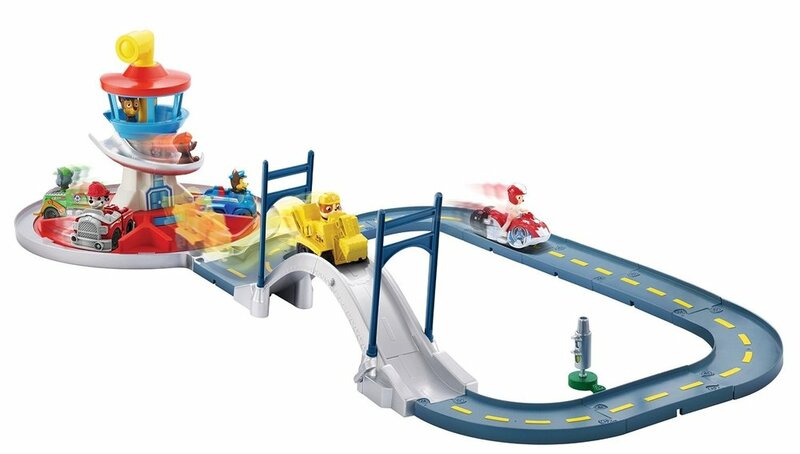 Build the track set, and then join the PAW Patrol to save the day - you need to repair the bridge! Turn the Lookout Tower to rotate and push to launch the PAW Patrol into action! Connect other Roll Patrol track sets and create all new adventures (each sold separately). All PAW Mini Figures and Racers work with Roll Patrol sets (sold separately). Launch 'n' Roll Lookout Tower Track Set is for ages 3+. No batteries required. All good UK toy shops.